If you see this yellow exclamation point (pictured below) on your Accounts page then it means Block Sender can’t connect to your Gmail account. 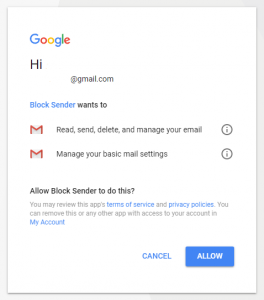 This disconnection from Block Sender can happen if you change your Gmail/Google password, if Gmail detects an intrusion in your account, or if you revoke Block Sender’s connection to your account. Login to the dashboard at https://app.blocksender.io. 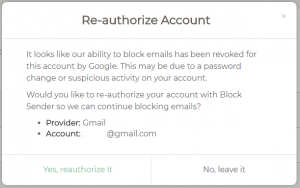 Find the email account that needs to be re-authorized in the list of accounts. 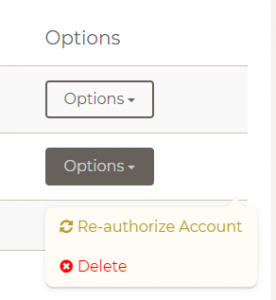 Click the “Options” button, and then select “Re-authorize Account”. Find and select the email that needs to be re-authorized from the list of Google accounts and then click “ALLOW” on the screen that follows. Note: If you receive an “access_denied” error, then please make sure your Google account credentials (username and password) are correct.